I just returned from my 15-year college reunion. It'd been almost that many years since I'd set foot on campus or seen most of my classmates. It was great to reconnect after so much time, and we couldn't help but reminisce about the four-years we spent together. Of course, it didn't take us long to revert to some of our college habits: too much alcohol, closing down fraternity parties, and eating greasy foods in the wee hours of the morning. It's funny what people remember though. Like the time J. passed out and peed on V's sofa and just flipped the cushion over, thinking no one would notice. Or how if we heard "Wicked Games" by Chris Isaak playing in C's room, he was in the process of trying to get lucky, assuming no girl could resist the power of this romantic song. Several people recalled my traditional college breakfast, which consisted of a Super Big Gulp and chocolate mini donuts. I'm not proud of it but it was my standard morning fare. 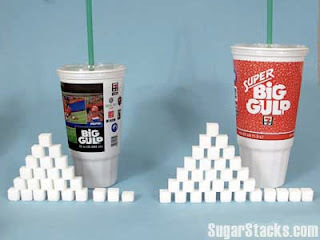 This new website dramatically illustrates the amount of sugar we consume using sugar cubes to represent how the sugars in some of our favorite foods literally stack up, gram for gram. My morning breakfast "sugar stack" looks like an advanced state in a Jenga game. I would never, under normal circumstances, sit down and throw back 24 sugar cubes. [Twenty-four cookies maybe or possibly even 24 beers, if I were still in college.] And the funny thing is I claim not to be a sweet tooth, often forgoing dessert for an extra piece of bread. But now I realize it's probably because I've already consumed enough sugar to put someone into a diabetic coma. Nice to "meet" you. I hope you'll come back to visit often. I just checked out your blog. Great stuff!